Corporate Holiday Gift Baskets Delivery USA: Send in your appreciation, thank you, acknowledgment and best wishes to your business partners, clients and employees. Your Business associates are worthy. It’s important to maintain amicable relationships with them. It will help in strengthening the business with them. To support you with that we have different corporate gift basket ideas that will bring a pleasant smile on your business associates. Starting from fresh fruit bouquets to sweet and savory items gourmet basket is available. Each of them is perfect for office parties, promotions and more occasions. A complete collection of unique corporate gift baskets that are waiting for you to try. Our talented team looks after all the gift baskets. If it is the birthday of your loyal acquaintance, then you can surprise him/her with birthday cake and order online birthday balloons that are bouncy and savory. All the gift baskets arrive with first class delivery services. To express your grand gesture of Thank you, pen it down to the note attached to it. SHOP NOW! Your boss is the one who appreciates your work. He is also someone who will push you to boundaries and try something new. Say thank you to him and offer corporate holiday gift baskets and hampers by purchasing from our gift store. Without emptying your pockets we invite you to explore. Our aim is to provide you with gifts of the highest standards. A deluxe set of hampers like gourmet gift hampers is used to make a statement. Moreover, you can have sweet cheese baskets to impress your boss. The awe-striking look of the gifts will win the heart of your boss. If you wish to honor him/her, go ahead and give chocolate hampers which are irresistible. Celebrate the birthday of your boss with birthday cookies and add cheers. We also make international Corporate Gift Baskets delivery in countries like France, Australia, Canada, Germany, UK, Spain and many more. What to Gift? 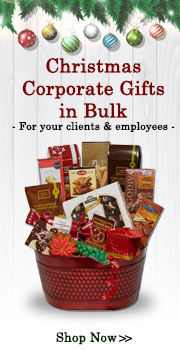 Need some ideas on Corporate Gift Baskets delivery ? It is not always easy to decide on what to send for that upcoming birthday or anniversary or on those special occasions such as Christmas gift baskets, Valentines day gifts and Mother's day gifts. Without further due, here are few gift ideas or more like pointers to help decide on what to gift. As a broad category, you may choose to send balloons, flowers, gift baskets, plants, cookie bouquet, candy bouquet, bonsai tree, plush animal or a personalized gift item. First thing you want to decide is if you Corporate Gift Baskets delivery USA is to impress the recipient or if it is to convey your sentiments of love, care, thanks or condolence. Recipient of your Corporate Gift Baskets delighted reading your personal card message sent with the Corporate Gift Baskets in USA.